On Sunday, Bud Light, the official beer sponsor of the NFL, kicked off its NFL ad campaign for the season with a new Up For Whatever creative spot. 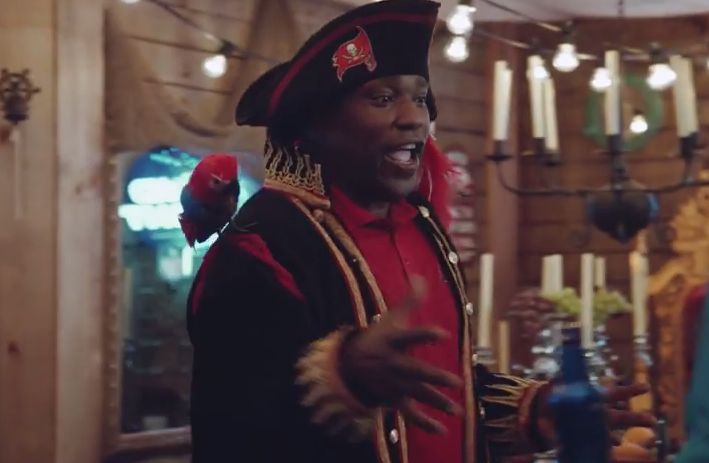 The video features a Buccaneers fan who gets his house “Buccaneer’d” by NFL legend Warren Sapp wearing a parrot on his shoulder while facilitating a backyard cannon firing as beautiful pirate maidens cheer. And remember, if you’re holding a Bud Light in your hand while watching a NFL game this season, it means you’re #UpForWhatever – and anything can happen! Print article This entry was posted by Art Eddy III on September 29, 2014 at 12:42 pm, and is filed under Sports. Follow any responses to this post through RSS 2.0. Both comments and pings are currently closed.